The Mach series of CNC programming software was originally developed for the home hobbyist, but has quickly turned into one of the most versatile control packages for industrial use as well. 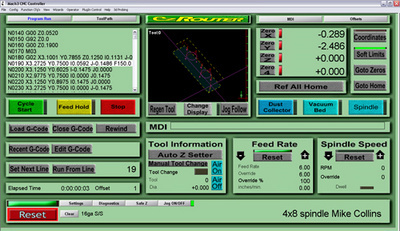 Here is a screenshot preview of ez Router's Mach3 controller software. Converts a standard PC to a fully featured, 6-axis CNC controller. Pulse rate selectable at 2500, 35000 and 45000 pulses per second simultaneously on 6 axis. (7 if pulsing a servo spindle). Full range of G-Code supported. Polar coordinates, spindle, flood, mist, relays, ModBus I/O. User Writable M-Code and Macros using VB script. Screen Designer for developing your own Screen Layouts. Rotatable, zoomable and panning tool path display. Plasma Torch Height Control with added THC Kit from Campbell Designs. DXF import for 2.5D G-Code generation. BMP,JPG imports for Engraving photographs. Multiple techniques supported. HPGL Import form Corel draw and other drawing programs. Wizards to create G-Code for various CNC operations, Bolt hole circles, flanges, Milling, Threading...ect. User Creatable Wizards for further CNC support. Multipass option for controlled depth iterations from a single job. AntiCorner Dive for Plasma control. You'll find that the Mach3 version of this excellent CNC programming software is standard equipment on every routing or cutting machine by ez Router.